In the heart of Kollwitzkiez stands the Kulturbrauerei (Culture Brewery) — a massive red and yellow brick complex that now serves as the cultural center of Berlin’s trendy Prenzlauer Berg district. The 163-year-old structure was home to the Schultheiss Brewery from the mid-1800s until 1967. A full forty nine years after, freshly brewed beer has finally made its way back to these grounds with Handgemacht 2016, a three-day-long street food and craft beer festival. From May 20 until 22, the sprawling courtyards of the Kulturbrauerei were lined with over 60 stalls and trucks all offering lovingly crafted food and drinks. The event is an offshoot of the Street Food auf Achse (Street Food on Wheels) project, a weekly handmade food market that has been taking place at the complex every Sunday since January 2015. With a total of 33 craft breweries participating at the event, Handgemacht is Berlin’s biggest craft beer event to date. Of the 33 beer exhibitors, 28 are local Berlin breweries. Brimming with inspired cosmopolitans, it comes by no surprise that Berlin has been a fertile breeding ground for the craft beer movement. The marked diversity, creativity, and progressiveness of the city as a whole has been crucial to the development of the craft beer movement in Germany, a country that takes its brewing tradition so seriously that it’s taken the form of dogma. Walking through the festival, I was happy to see stall after stall with popular craft beer styles on offer— not at all a common sight in Germany. Particularly valiant among these attempts were those made by Superfreunde and Lenny’s Artisanal Ales. Superfreunde’s Super Ale (5.9% ABV) is an IPA that is ridiculously easy to drink owing to its luxuriously creamy texture and delicate bittersweetness that hits the right spot. The marriage of centennial, cascade, and Styrian golding hops impart the Super Ale with beautiful citrus and floral notes, effectively the smell of a German summer captured in a bottle. Lenny’s Artisanal Ales are a staple at pretty much every craft watering hole in Berlin, by virtue of the consistently sterling quality of their beers. Since it was around 74 degrees the entire weekend, the last thing I was looking for was a dark beer, and yet I couldn’t resist the Belizean Chocolate Cherry Porter (8.2% ABV) when I saw it on offer at their stall. The very balanced Baltic porter actually turned out to be very refreshing thanks to its gossamer cherry finish. 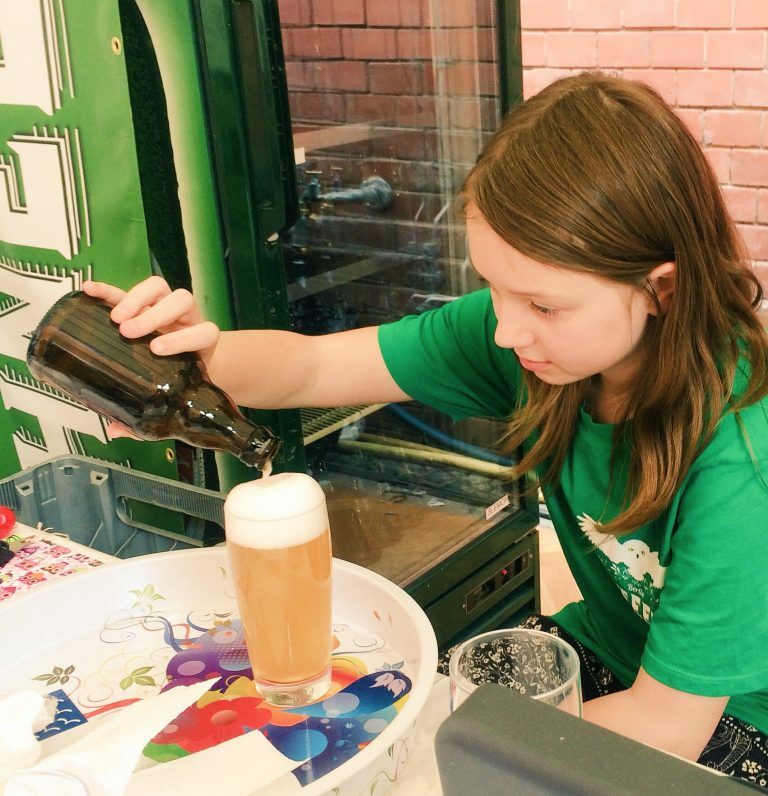 As exciting as it was see these German microbreweries finally catching up with the more popular American craft brewery selection, the true stars of the festival were the creative interpretations of traditional German beer styles. These attempts are particularly interesting because they demonstrate how it is possible to revolutionize German brewing without violating the famous 500-year-old Beer Purity Law (Reinheitsgebot), a law which some have instinctively blamed for stifling the craft beer movement. Standing out in this category were Two Fellas Brewery, Schneeeule, and Fräulein Brauer. Among the German beer styles, my mortal enemy is decidedly the Gose— which is rather unfortunate because I actually live in the city where it is brewed. After trying a dozen different brands and still loathing it, I eventually just started avoiding the style like a plague. Two Fellas Brewery, however, managed to craft what I thought was impossible: #SorryNotSorry Sour Gose (4.6% ABV), a Gose that I actually enjoy. Their version masterfully plays up both the sourness and the crispness characteristic of the classic Gose, making it definitely one of a kind. Schneeeule’s Kennedy (3% ABV) is a hopped up Berlin White. A Berlin White is typically mixed with some flavoring to ease its distinctive sourness when it is served, but the bitterness of the American hops in the Kennedy accomplishes the same balancing effect. This effervescent beer oscillates between grassy and fruity, the perfect session beer for sunny spring days. For their first year, Fräulein Brauer is committed to brewing at least one new style every four weeks. This is both a curse and a blessing: you can’t get too attached to their beers because you don’t know when you'll have it again, but there’s also so much to look forward to. On tap at the event was their Tante Monroe (6.6% ABV), a Bock beer made gutsy by a hearty dose of monroe hops. With a stunning mango aroma, a medium-full mouthfeel, and a very hop-forward bitterness, this amber-colored ale was definitely my favorite for the weekend. I fervently hope that they eventually keep this brew as a staple.